This illustration shows how cubic titanium nitride with a three-to-four ratio can be synthesized under extreme pressures and temperatures in a laser-heated diamond anvil cell. Image courtesy of Venkata Bhadram. 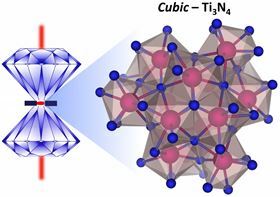 A team of experimental and computational scientists led by Tim Strobel and Venkata Bhadram at the Carnegie Institution for Science have synthesized a long sought-after form of titanium nitride, Ti3N4, which has promising mechanical and optoelectronic properties. Standard titanium nitride (TiN), with a one-to-one ratio of titanium and nitrogen, exhibits a crystal structure resembling that of table salt, or sodium chloride (NaCl). It is a metal with abrasive properties and is thus used for tool coatings and manufacturing electrodes. Titanium nitride with a three-to-four ratio of titanium and nitrogen, known as titanic nitride, has remained elusive. This is despite previous theoretical predictions of its existence and the fact that nitrides with this ratio have been identified for the other members of titanium's group on the periodic table, including zirconium. Strobel and Bhadram's team, which included Carnegie's Hanyu Liu and Rostislav Hrubiak, as well as Vitali Prakapenka from the University of Chicago, Enshi Xu and Tianshu Li from George Washington University, and Stephan Lany from the US National Renewable Energy Laboratory, took up the challenge. They report their work in a paper in Physical Review Materials. They created Ti3N4 in a cubic crystalline phase using a laser-heated diamond anvil cell, which was brought to about 740,000 times normal atmospheric pressure (74 gigapascals) and a temperature of 2200°C. Advanced x-ray and spectroscopic tools confirmed the crystalline structure the team had created under these conditions, and theoretical model-based calculations allowed them to predict the thermodynamic nature and physical properties of Ti3N4. Table-salt-like TiN is metallic, which means it can conduct a flow of electrons to generate a current. But cubic Ti3N4 is a semiconductor, which means it can have its electrical conductivity turned on and off. This possibility is tremendously useful in electronic devices. Titanium-based semiconductors are particularly popular as catalysts for solar water-splitting reactions to produce hydrogen, a clean renewable-energy source. This ability to switch the conductivity on and off arises because some of a semiconductor's electrons can move from lower-energy insulating states to higher-energy conducting states when subjected to an input of energy. The energy required to initiate this leap is called a band gap. The band gap for cubic Ti3N4 turned out to be larger than expected based on previous model predictions. Furthermore, like metallic TiN, Ti3N4 is expected to exhibit excellent mechanical and wear resistance properties. "To our knowledge, this is the first experimental report on semiconducting titanium nitride," said lead author Bhadram. "We believe that this work will stimulate further experimental and theoretical efforts to design new ways to scale up the synthesis of Ti3N4 at ambient pressure." This story is adapted from material from the Carnegie Institution for Science, with editorial changes made by Materials Today. The views expressed in this article do not necessarily represent those of Elsevier. Link to original source. Using an ultrafast electron microscope, researchers have recorded the first-ever videos showing how heat moves through nanoscale materials. Semiconductor made from organic and inorganic materials can convert electricity into light efficiently.